Princeton alumni from South Carolina owned successful plantations, large numbers of slaves, and served as leaders in the Confederate cause during the Civil War. Of over 600 Princeton alumni who served in the Civil War, more than half of them fought for the Confederacy. 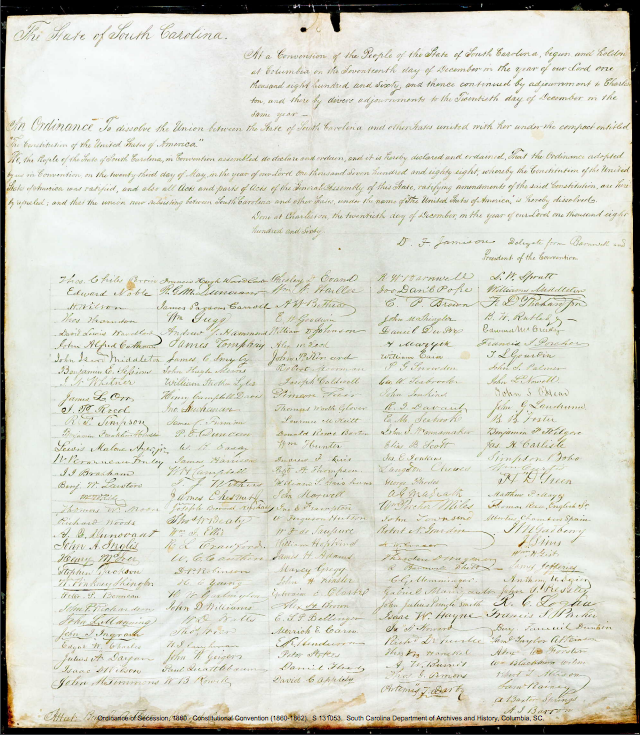 Others helped draft the founding documents of the rebellion. In South Carolina alone, four Princetonians drafted and signed the state’s Ordinance of Secession: Ephraim Mikell Seabrook (class of 1823), John Townsend ('1819), James Chesnut Jr. ('1835), and John L. Manning ('1837). Examination of the lives of the two most prominent signatories, James Chesnut and John Manning, points to some of the reasons Princeton alumni came to ally themselves against the Union in defense of slavery. James Chesnut, Jr. was a member of Princeton’s class of 1835. After graduating, he returned to his home state of South Carolina and pursued a career in politics. Like his father and grandfather before him, Chesnut served as a legislator in the South Carolina Senate from 1852 until 1858. As a state senator Chesnut was relatively moderate on the question of slavery, strongly opposing South Carolina's efforts to reopen the African slave trade in the 1850s. Chesnut's views radicalized, however, after his election to the United States Senate in 1858. In 1860, Chesnut became the first Southern senator to resign his seat over the election of President Abraham Lincoln. Shortly after—alongside his Princeton classmates—Chesnut signed South Carolina’s Ordinance of Secession and eventually served on the committee that drafted the Constitution of the Confederate States of America. But Chesnut’s service to the Confederacy did not end with legislation. Chesnut was an aide-de-camp to Confederate General P.G.T. Beauregard at the start of the Civil War, in which capacity he ordered the firing on Fort Sumter—the first act of wartime hostilities. Later, Chesnut became a Confederate brigadier general himself. John Lawrence Manning graduated from Princeton in 1837, just two years after Chesnut. Like Chesnut, Manning moved back to South Carolina after graduation and followed in his father’s political footsteps—serving as the governor of South Carolina from 1852 until 1854. Although Manning owned property in Louisiana, he made his home in South Carolina and spent most of his time at his plantations, Milford and Manchester. After his term as governor, Manning was elected to the state senate, where he served alongside Chesnut. Manning continued to represent South Carolina’s Clarendon district under the secessionist government from 1861 through 1865. When the war ended, South Carolinians re-elected Manning to the state senate, but because he refused to pledge an oath of allegiance to the United States Manning was never seated. His service to the Confederacy, the state of South Carolina, and the citizens of his hometown gained Manning respect among white South Carolinians. The town of Manning, the present-day county seat of Clarendon, was named in his honor. 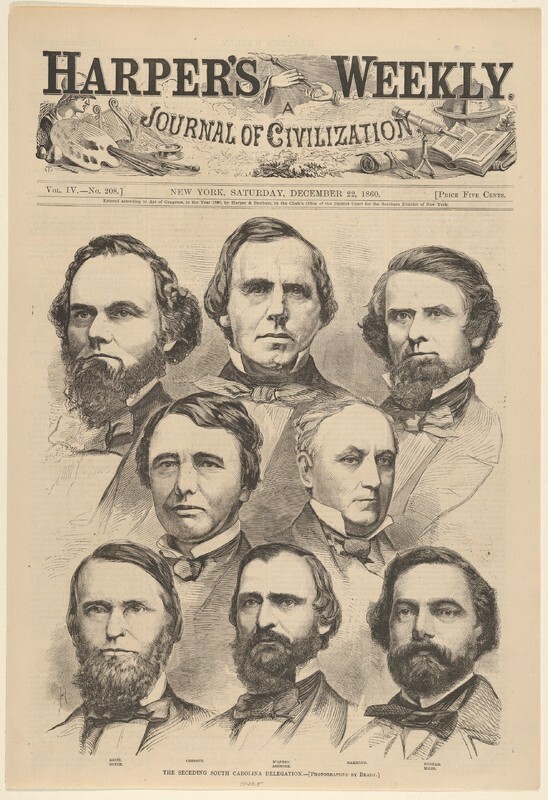 An illustration of South Carolina's secession delegation. James Chesnut Jr. is pictured in the second row, left. South Carolina's Ordinance of Secession, signed 20 December 1860. Sarah and Robert Gibbes were wealthy planters from South Carolina who sent their three sons—John, Lewis Ladson, and Thomas Stanyarn—to the College of New Jersey in the late 18th century. John, their eldest son and first to attend Princeton, graduated with the class of 1784. Letters from his mother Sarah, who missed her son dearly and wrote to him frequently from the time he left home until his graduation, kept John up to date on events at home. But along with news about his younger brothers and older sister, Sarah Gibbes spent a considerable amount of time advising her son on how to establish connections with prominent families in his new Northern residence—highlighting the role a Princeton education played in the formation of social networks among Northern and Southern elites. In one such letter, Sarah suggested that her son John maintain links with the Stocktons and Boudinots—both wealthy and influential New Jersey dynasties. John relied on an introduction from a fellow South Carolinian to acquaint himself with the two families, expanding his own family's social network even as his parents and siblings remained in South Carolina. Robert Gibbes, John’s father, was a successful rice and cotton planter. By the time of the Revolutionary War, Robert had inherited the family plantation, "Peaceful Retreat." During the war, British forces took possession of Peaceful Retreat. Despite threats to the contrary, soldiers did not burn the plantation—perhaps because of the reputation it had gained for being among the most elegant of the Charleston mansions. After the war, the Gibbes family regained control of Peaceful Retreat. Robert Gibbes's meticulous plantation records demonstrate the pride he took in Peaceful Retreat. His record books inventoried the equipment used on the plantation, the specific layout of the land, and the names, ages, and monetary worth of Peaceful Retreat’s most valuable assets: Robert Gibbes's slaves. Upon his death in 1794, the Gibbes family's slaves were worth a total of over $6,000. The revenue that these enslaved men and women generated for the Gibbes undoubtedly helped Robert and his wife send their three sons to the College of New Jersey. After their father's death, the Gibbes brothers continued to manage large South Carolina estates and scores of slaves. On his Atabula plantation, Lewis Ladson (class of 1790) lived off of the labor of eighty-four enslaved people, and John ('1784) owned fifty-one. A letter from Sarah Gibbes to her son John, then studying at Princeton. Sarah described the Boudinot and Stockton families as "very worthy of praise." 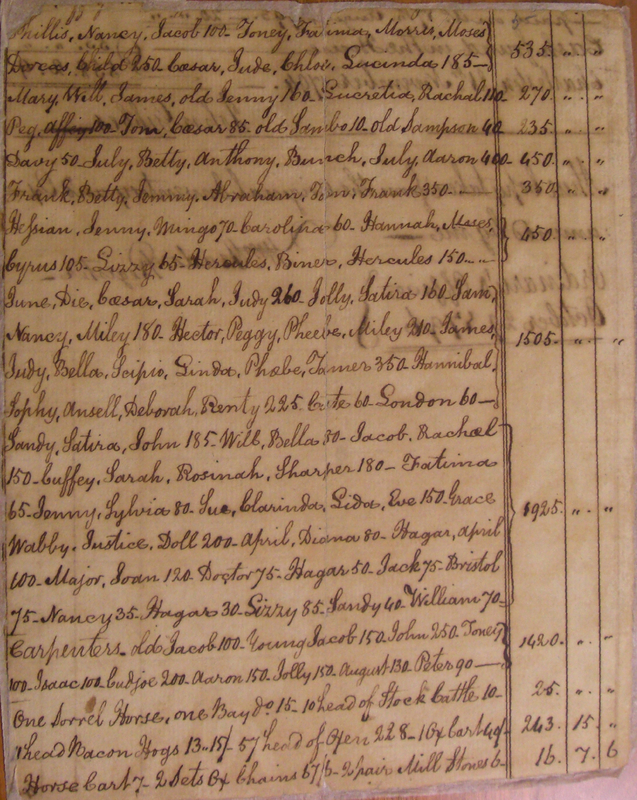 An inventory of Robert Gibbes's estate, including a detailed list of his slaves. Lesa Redmond graduated from Princeton University in 2017 with a degree in History and a certificate in African American studies. Her independent research focused on Princeton University's connection to slavery. For her senior thesis, she explored Princeton's sixth President, John Knox Witherspoon, and his ties to slavery. W. Barksdale Maynard, “Princeton in the Confederacy’s Service,” Princeton Alumni Weekly, accessed 22 February 2017, https://paw.princeton.edu/article/princeton-confederacys-service. "Ordinance of Secession, 1860," Constitutional Convention (1860-1862), South Carolina Department of Archives and History, Columbia, SC; Database of Princeton Student Origins, Princeton & Slavery Project, accessed 16 October 2017, slavery.princeton.edu/sources/database-of-princeton-student-origins. J. Jefferson Looney and Ruth L. Woodward, Princetonians, 1791-1794: A Biographical Dictionary (Princeton, NJ: Princeton University Press, 1991), 151. Chesnut, James, Jr.; 1835; Undergraduate Alumni Records, 19th century, Box 86; Princeton University Archives, Department of Rare Books and Special Collections, Princeton University Library. Bill Chisholm, “John Lawrence Manning (1816-1889),” Find A Grave Memorial, accessed 22 February 2017, http://www.findagrave.com/cgi-bin/fg.cgi?page=gr&GRid=37406128. "SC Governors - John Lawrence Manning, 1852-1854," South Carolina's Information Highway, accessed 22 February 2017, http://www.sciway.net/hist/governors/jlmanning.html. For inventories of Ephriam Mikell Seabrook, John Townsend, James Chesnut, Jr., and John L. Manning’s slaves, see: 1860 U.S. Federal Census, Slave Schedules, www.ancestry.com. Gibbes Family Papers, Box 11, Folder 151/7, South Carolina Historical Society. 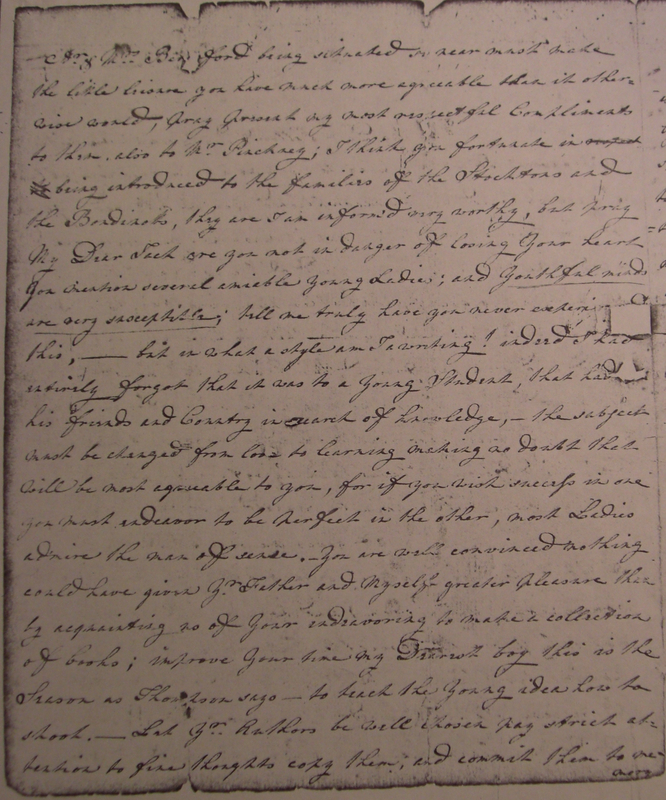 Sarah Gibbes to John Gibbes, 1783, Gibbes Family Papers, Box 11, Folder 151/7, South Carolina Historical Society. Elizabeth Fries Ellett, “Sarah Reeves Gibbes,” The Women of the American Revolution, Vol. 1 (New York: Baker and Scribner, 1850), 208. “Inventory of Estate for Robert Gibbes, Esq.,” October 1794, Gibbes Family Papers, Box 11, Folder 151/10, South Carolina Historical Society. For an inventory of Lewis Ladson Gibbes’ slaves, see: 1820 US Federal Census, www.ancestry.com; Ruth L. Woodward and Wesley Frank Craven, Princetonians, 1784-1790: A Biographical Dictionary (Princeton, NJ: Princeton University Press, 2014), 31–33.